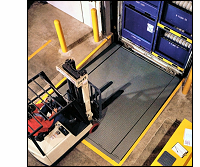 Serco hydraulic dock levelers are designed for fast, easy and safe push-button operation. Featuring our unique Clean-Frame® design for full structural integrity with wide-open access to the leveler pit for easy cleanup of spills and trash removal, regenerative hydraulics to ensure low maintenance and reliable performance in all environments and weather conditions, and the Serco Hydra-Max® Control Lip for improved dock safety, reduced maintenance and increased working life, Serco hydraulic dock levelers are a quality investment for your dock. A hydraulic leveler that features mechanical lip extension, safety velocity fuse, push-button control and integral maintenance strut and lip support latch. Inverted hydraulic cylinder to eliminate damage due to debris and dust. Serco’s base model hydraulic dock leveler featuring power-in/power-out lip control, single push button control, safety velocity fuse, Clean-Frame® design, integral maintenance strut and permanent nite-lock prevents unauthorized entry beneath dock doors. A hydraulic leveler featuring power-in/power-out lip control, automatic return-to-dock, single push button control, safety velocity fuse, Clean-Frame® design, integral maintenance strut and more. Integral hinged maintenance strut and lip support latch with lockout capability. A hydraulic leveler featuring push-button control with quick-cycle lip extend and mushroom-style stop button, power-in/power-out lip control, safety velocity fuse, Clean-Frame® design, integral maintenance strut and more. The top-of-the-line conventional pit-style leveler with Clean-Frame design, weather seal, grease fittings and control panel with mushroom-style stop button, quick-cycle lip extend and auto return-to-dock. Regenerative hydraulics with non-adjustable safety velocity fuse. Two main and lip hydraulic cylinders, five-position rear hinge with steel bushings and velocity fuse safety system. Full control panel with mushroom-style stop button, quick-cycle lip extend and auto return-to-dock. Structural center beam support for three-wheeled forklifts. The patented Serco Versa-Dock XL is the only dock leveler with the flexibility to handle conventional loads as well as high-cube (low boy) below-dock loading at the same dock position. The Versa-Dock XL offers 9′ wide access for below dock loading, making it ideal for automotive applications where 8′ wide racks are common. It provides full and unobstructed access for wide rack loads, eliminating the need for dedicated docks or truck leveling devices and reduces the risk of damaged cargo from contact with the leveler pit sides.